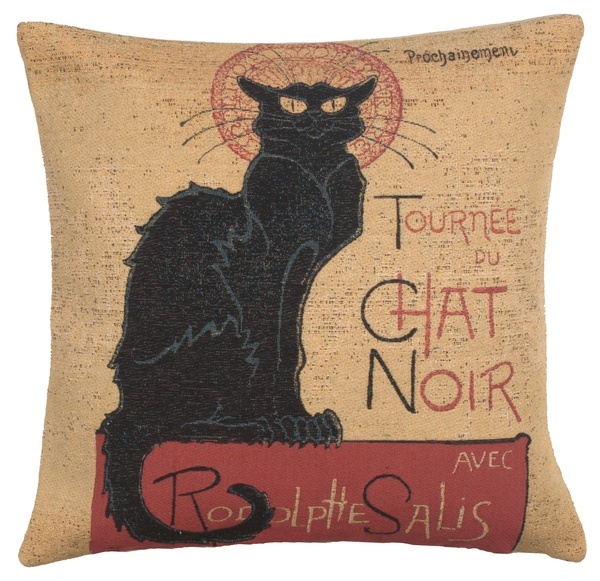 Tournee Du Chat Noir woven European tapestry cushion cover features the ad for Le Chat Noir (French for "The Black Cat") was a 19th-century cabaret, meaning entertainment, in the bohemian Montmartre district of Paris. It was opened on 18 November 1881 at 84 Boulevard Rochechouart by the artist Rodolphe Salis, and closed in 1897 after Salis' death (much to the disappointment of Picasso and others who looked for it when they came to Paris for the Exposition in 1900). Finish - Cushion cover backed with lining and zipper. Infill not included. Product care - Gently vacuum every 6 months. Dry clean only- when required. Cushion cover backed with lining and zipper. Infill not included.